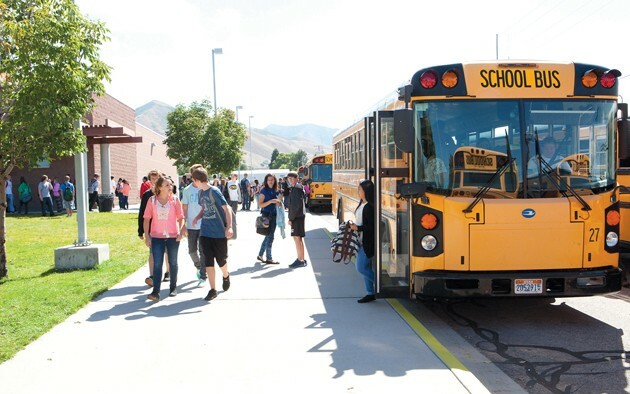 Tooele High and junior high students leave school Wednesday afternoon. 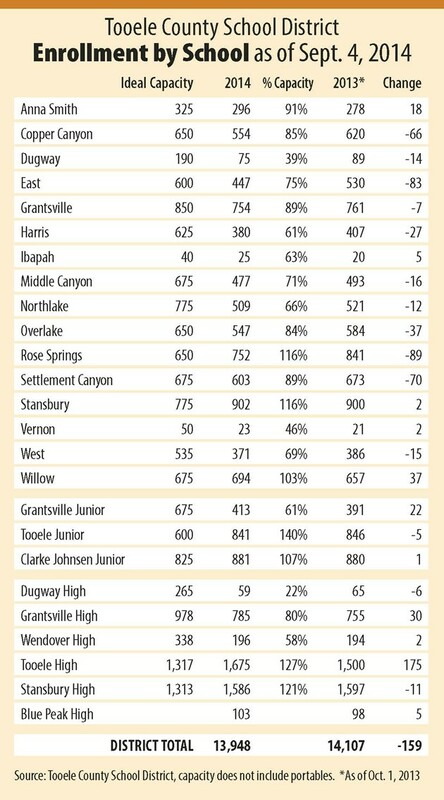 Enrollment numbers for schools in the Tooele County School District are in and show a drop in students compared to last year. Enrollment in the Tooele County School District dropped by 159 students, a 1.1 percent decline over last year, according to a district report. Released last week, the 2014 enrollment count for TCSD, as of two weeks after school opened, is 13,948. For comparison, the official enrollment count on Oct. 1, 2013 was 14,107. “With the opening of the new charter school, Scholar Academy, we anticipated that enrollment would drop,” said Superintendent Scott Rogers. The school district’s budget for the 2014-15 school year was based on 13,800 students, according to Rogers. Scholar Academy opened this fall with 472 students. 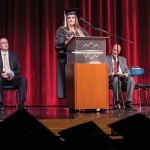 The school district’s enrollment dropped by 226 students, a 1.7 percent decline in the fall of 2009, the year Excelsior Academy opened. 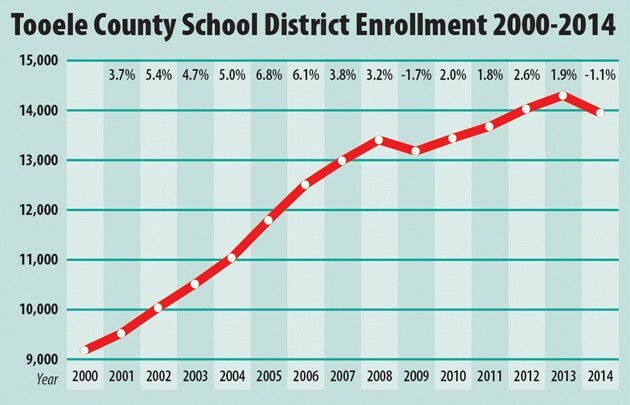 That was the last time TCSD experienced an enrollment decrease. Since 2000 the school district’s enrollment has increased by 4,771 students, from 9,177 to 13,948, a 52 percent increase. The fall 2014 enrollment decline was in elementary schools with a loss of 372 students, a 4.8 percent loss. Rose Springs Elementary lost 89 students, but remains at 116 percent of its ideal capacity. East Elementary lost 83 students and is currently at 75 percent of its ideal capacity. Willow Elementary gained 37 students and is at 103 percent of its ideal capacity. The start of dual-language immersion at Grantsville, Harris, Middle Canyon, Northlake and West elementary schools helped relieve overcrowding at some schools, according to Rogers. Enrollment in secondary schools in the school district this year went up by 213 students, a 3.4-percent increase. 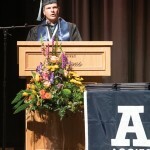 Tooele High School’s enrollment shot up by 175 students as a small graduating class, 286 in the fall of 2013, was replaced by a larger incoming freshman class, 473 in the fall of 2014. 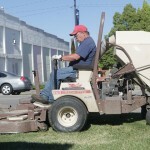 Stansbury High School’s enrollment dropped by 11 students. The district is keeping an eye on classroom size as enrollment changes during the first month of the year. But right now Rogers said he feels that overall class sizes are good. The average class size in kindergarten through sixth grade in Tooele Valley elementary schools was 22.3, according to the school district’s Sept. 4 class size count. Elementary class sizes range from 33 in three third grade classes and two sixth grade classes at Willow Elementary, to 15 in a kindergarten class at Harris Elementary, according to the school district’s report. Despite the decline in enrollment this year, the district’s projections show more growth in the future.